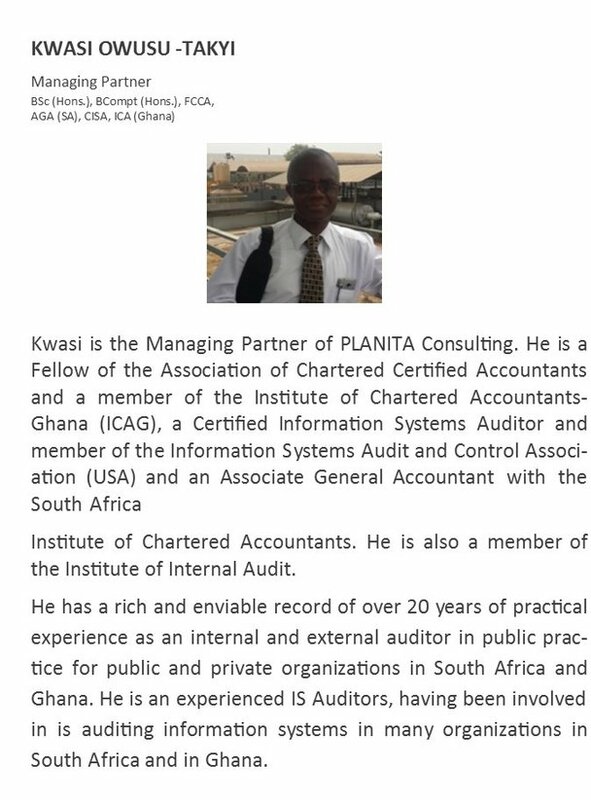 Planita is registered with the Institute of Chartered Accountants, Ghana (ICAG) to practice as a firm of Chartered Accountants in Ghana and all of its partners individually have personal practicing certificates and are registered to sign audit reports for all types of companies in Ghana in accordance with section 134(5) of the Companies Code 1963 (Act 179) of Ghana. We recognize that modern business needs have created a demand for a greater emphasis on personalized professional services. Clients want to feel that their professional advisors are close to them, understand and anticipate their requirements. Clients value advisors with clear opinions and insights based on top-of-the-range experience and value for money. We are committed to delivering impartial counsel and inspired solutions whilst being fully attentive to our client’s needs. Dedication to client service and value-added results.